The SURGICAL PHASE of the implant treatment of a maxillary central incisor affected by a root fracture has been previously described. 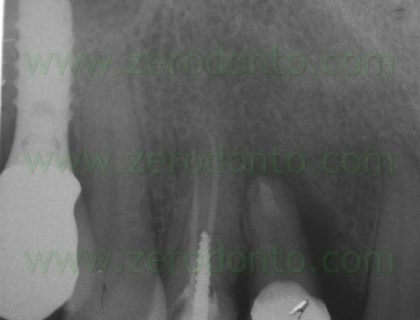 Such fracture was not diagnosed in time and the hopeless tooth was extracted. 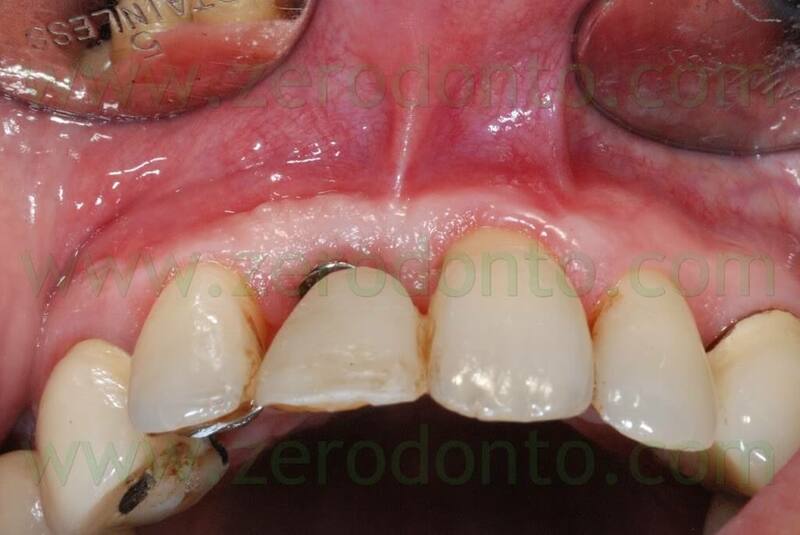 Then, the patient was subjected to presurgical orthodontic treatment to correct a diastema of about 3 mm between the maxillary central incisors. 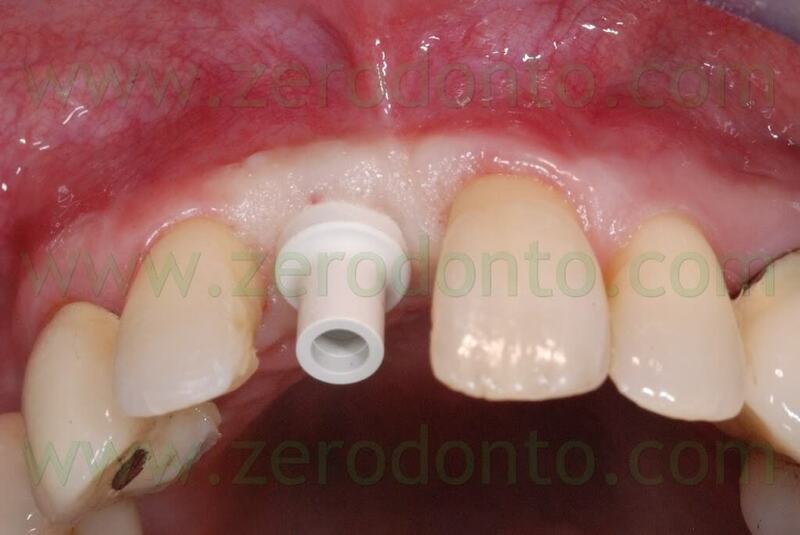 Finally, a Straumann RN 3.3×10 mm SLA implant was placed to restore the tooth. 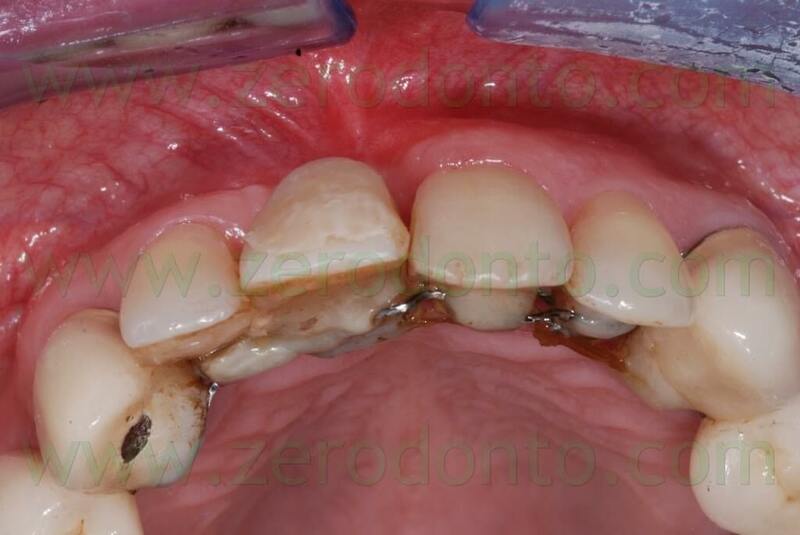 In the previous article, the orthodontic treatment has ben described as well. A lingual orthodontic approach without brackets was adopted, bonding the orthodontic wires with a flowable composite resin. 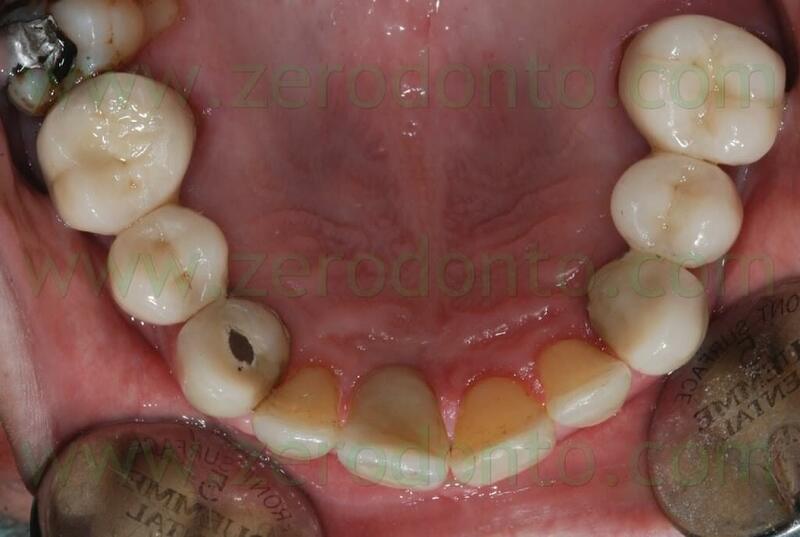 Tooth 11 was extracted and a 16-16 steel wire was modelled to passively fit to the palatal surfaces of teeth 12 and 13. Loops were modelled as well to retain the temporary restoration. A 0.195 multistrand wire for passive retainers was then modelled and bonded to the palatal surfaces of teeth 21, 22 and 23. 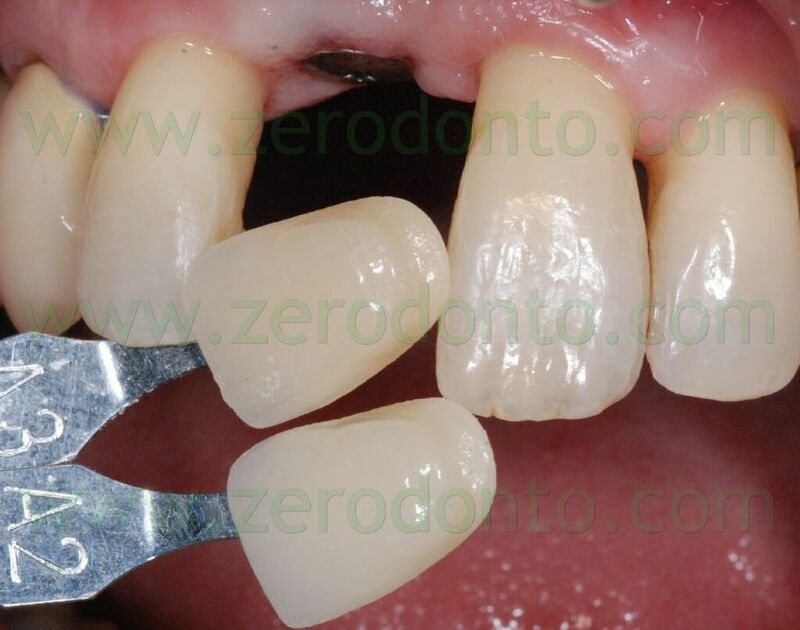 The temporary restoration was drilled in order to bond the retentive loops by means of a flowable composite resin. 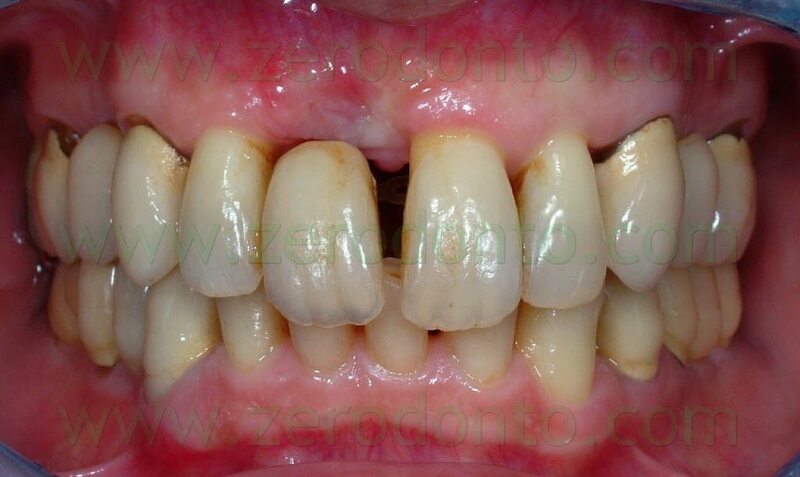 An elastic chain stabilized with ligatures between teeth 21-22 and 12-13 was used to close the diastema. Such elastic chain was changed every 3 weeks and the space was closed in about 12 weeks. 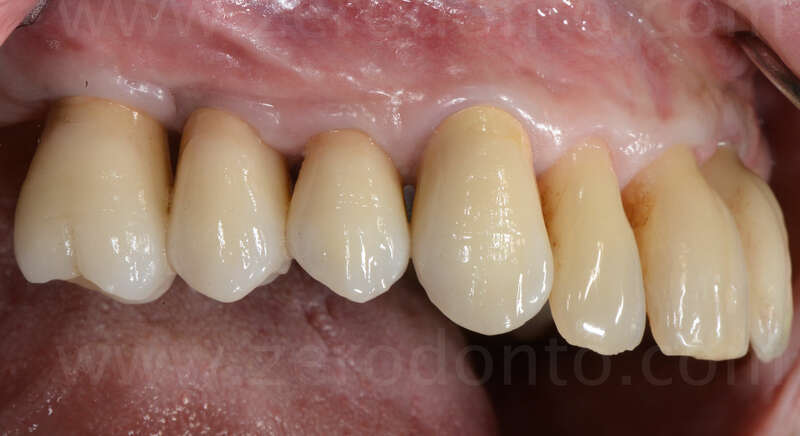 Once the diastema was completely closed, the elastic chain was removed and a passive retainer was bonded onto the palatal surfaces of the temporary restoration and tooth 21. 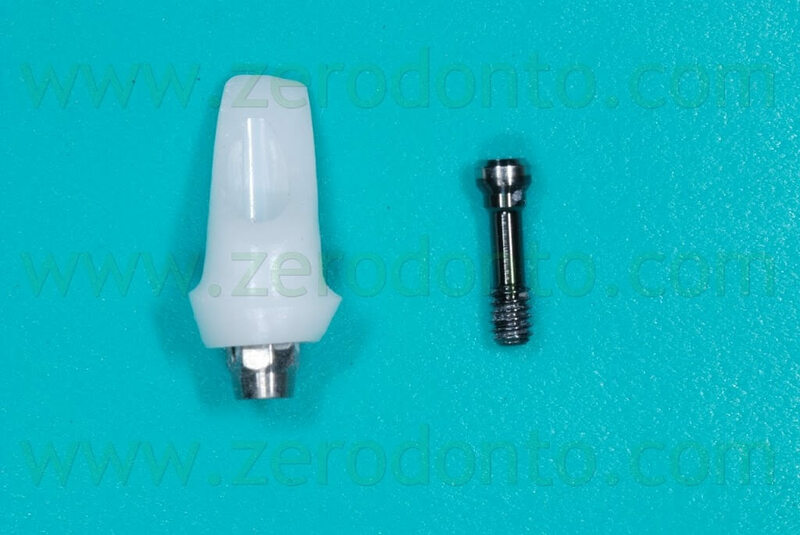 Then, the implant was placed by means of a controlled bone expansion technique using calibrated increasing diameter bone expanders. 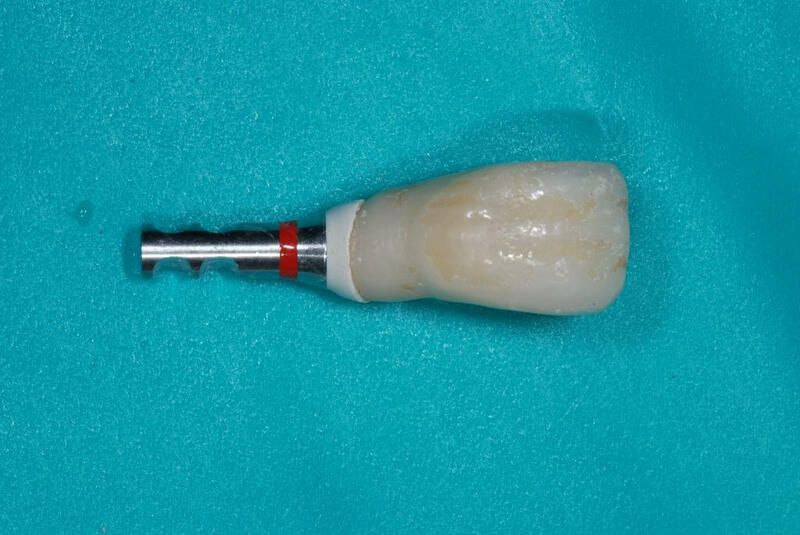 Once the osseointegration was achieved, the 51-year old male patient, who had a medical history of periodontal disease treated and stabilized, was exhaustively informed about the therapeutic choices available for his prosthetic treatment. 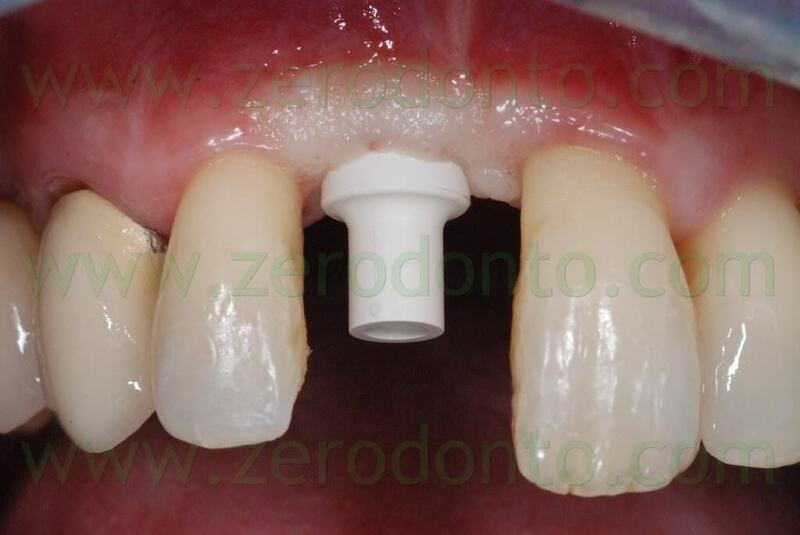 He agreed to realize an implant-supported zirconia-ceramic single crown cemented onto an Etkon™ zirconia abutment. 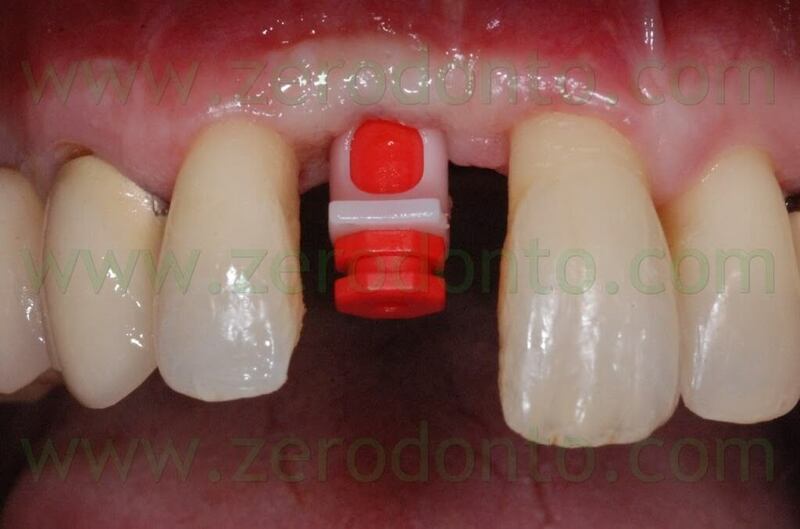 The Straumann RN 3.3×10 mm SLA implant was correctly placed according to the position of the adjacent teeth and the arch line. 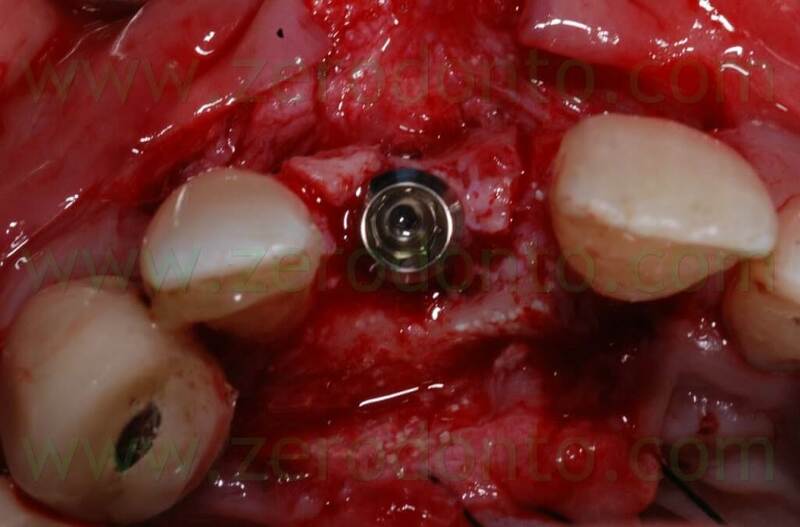 Implant placement was decided on the basis of a diagnostic wax up realized accordingly to the principles of implant placement in the esthetic zones described in the literature. 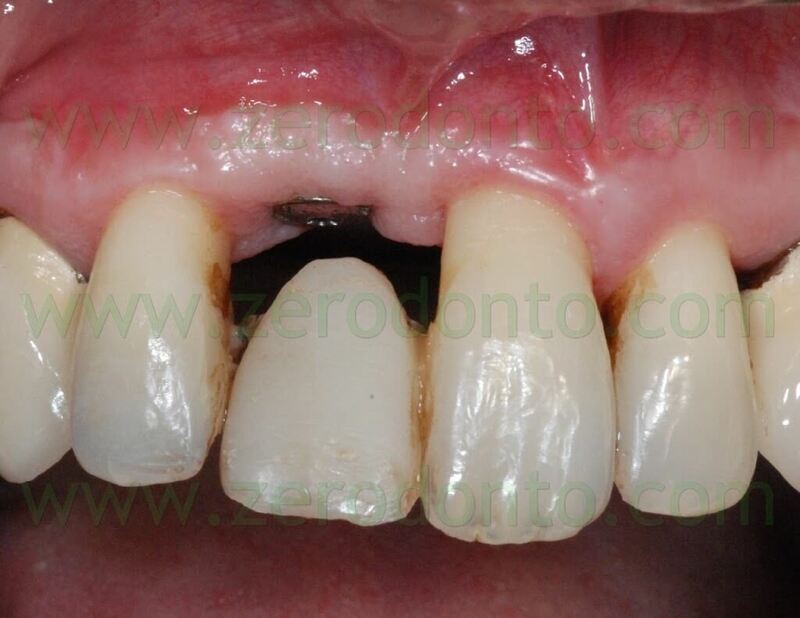 During implant healing, an acrylic resin ortho-pontic was used as temporary restoration, since the patient was completing the orthodontic therapy. 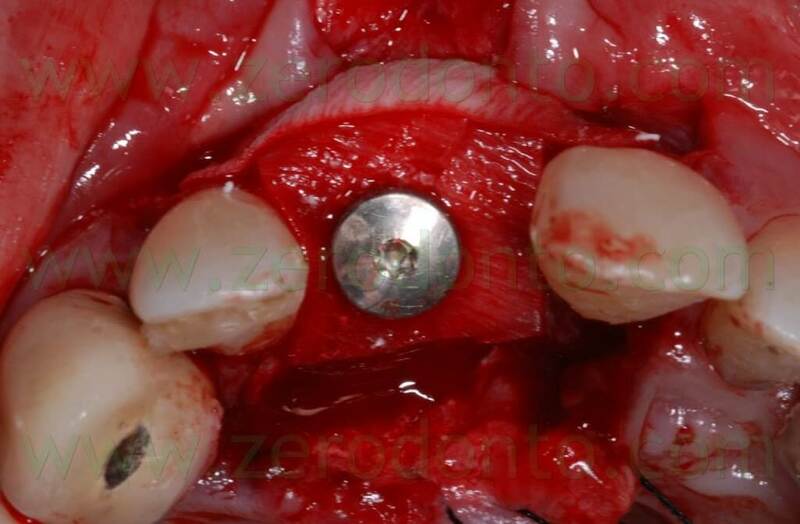 At level of the cervical margin, the pontic was realized to be far 2 mm from periimplant soft tissues, in order not to cause micromovements of the fixture which could compromise its osseointegration. 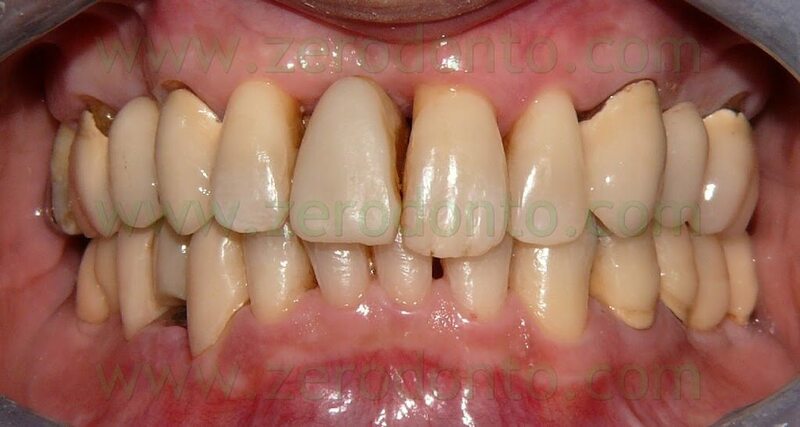 As evaluated during the study of the case, such prosthetic design did not affect esthetics, since the patient had a low smile line. 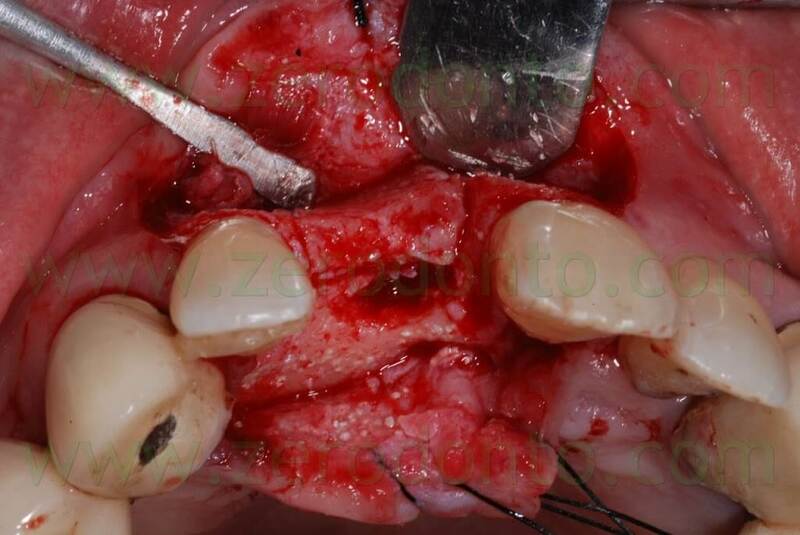 The pontic was infraoccluded and the occlusal contacts in centric relation, protrusion and lateral movements were carefully distributed on the adjacent teeth. 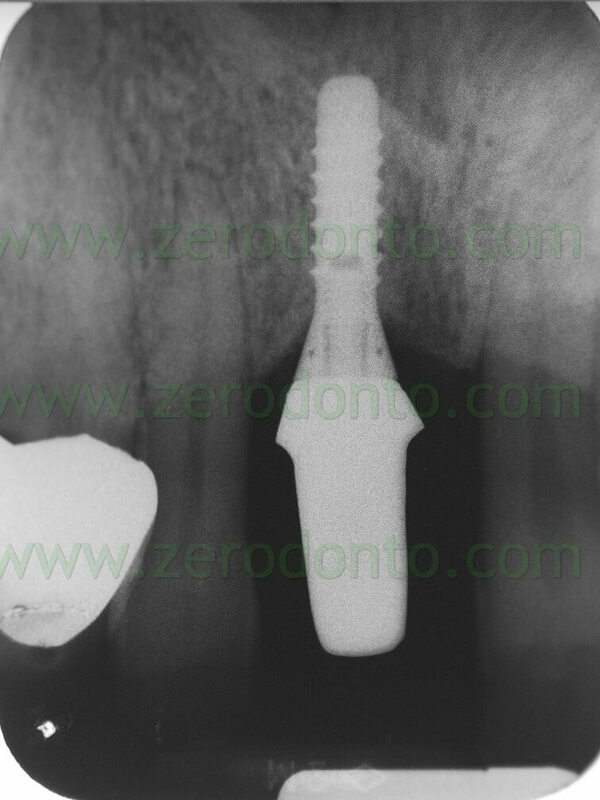 The patient was thoroughly informed about the correct home oral hygiene procedures, in order to avoid food impaction on the healing screw as well as in the interproximal spaces. 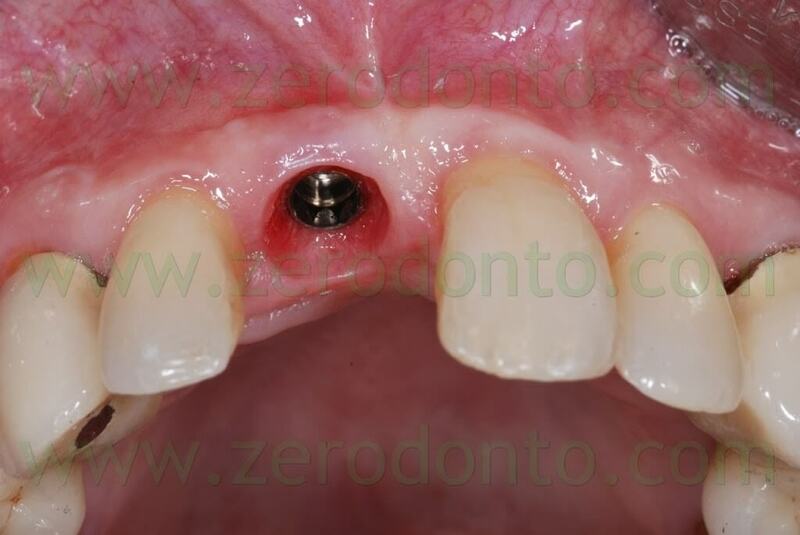 After implant healing, the stability of periimplant soft tissues and the proper osseointegration were verified both clinically and radiographically. 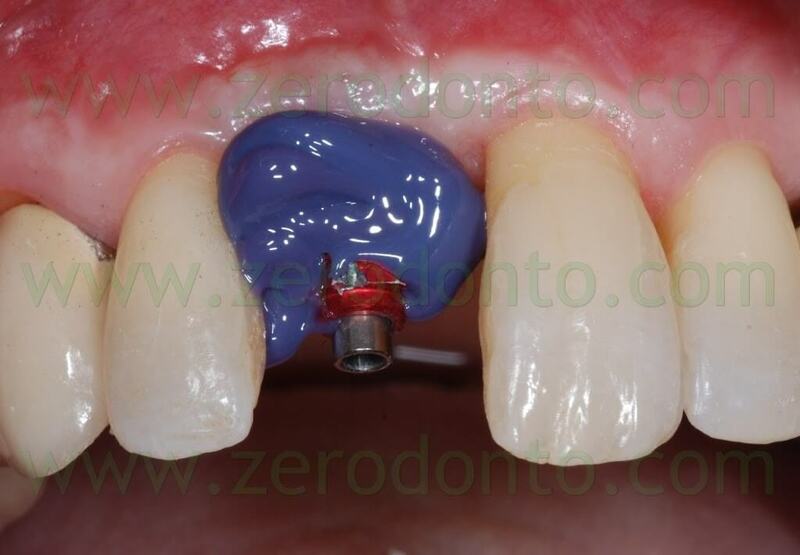 Then, the orthodontic retainer was removed and a color check of the adjacent teeth was made to realize a fixed temporary crown in acrylic resin. 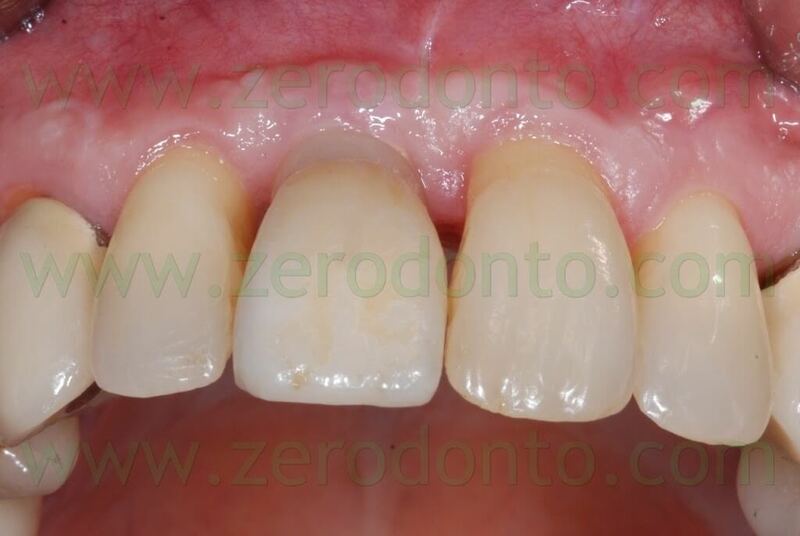 The temporary restoration was realized onto a Straumann secondary customizable mesostructure. 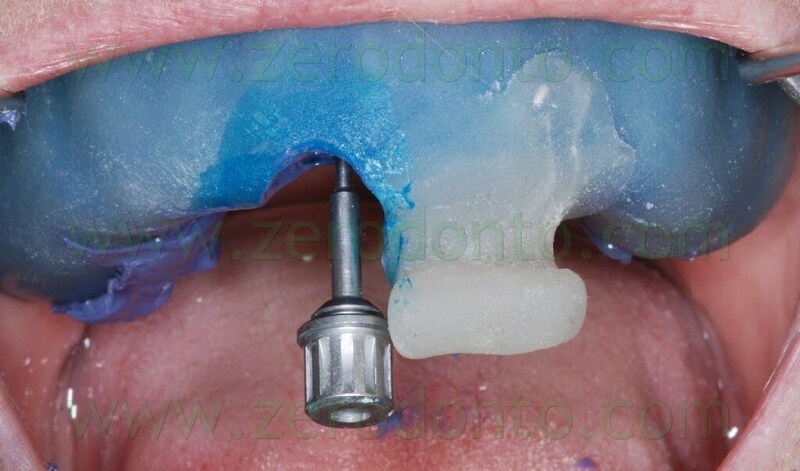 Such temporary abutment was screwed intraorally, its correct three-dimensional position was checked both in mesial-distal and buccal-palatal directions and an impression was made by means of snap-on copings, in order to transfer to the dental laboratory the correct implant position. 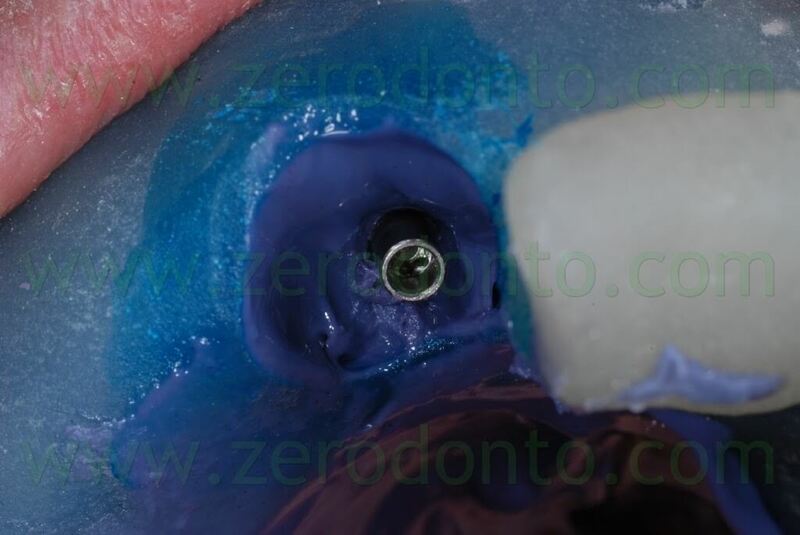 The dental technician customized the temporary abutment preparing the shoulder 2 mm under the level of periimplant soft tissues and the emergence profile was designed so as to correctly shape the transmucosal passage. 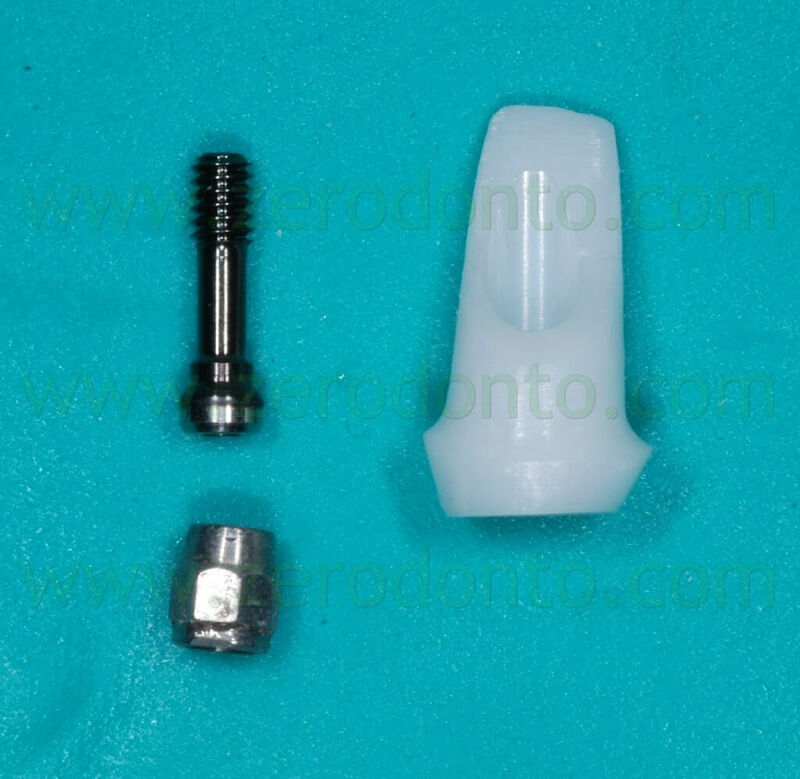 The coupling precision between the temporary crown and the abutment was verified extraorally by means of an implant laboratory analogue. 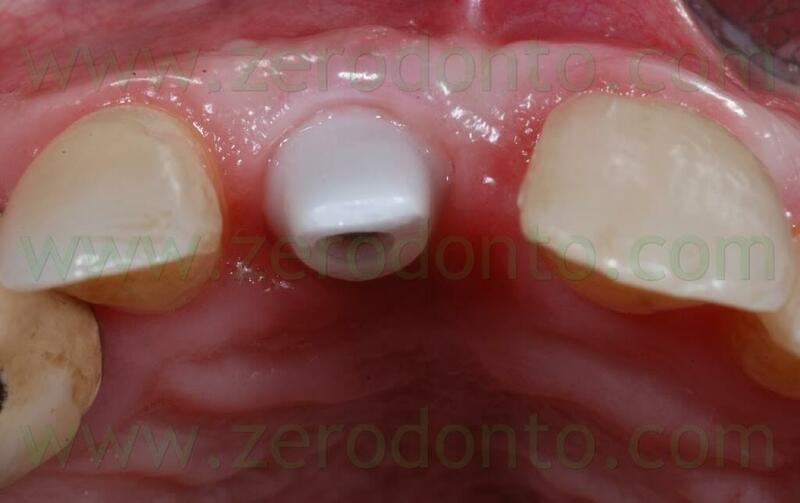 Then, the abutment was screwed intraorally at 15 Ncm and the crown was cemented with a resin temporary cement. 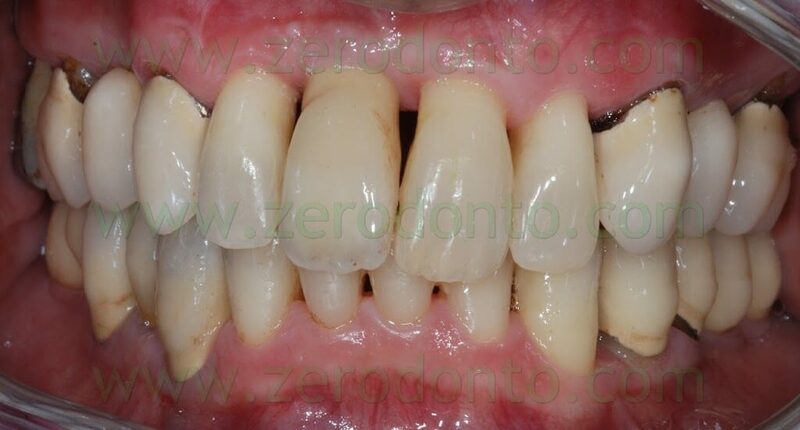 Before the provisional cementation, the outer surfaces of the crown were isolated using liquid paraffin, in order to facilitate the removal of cement excess. 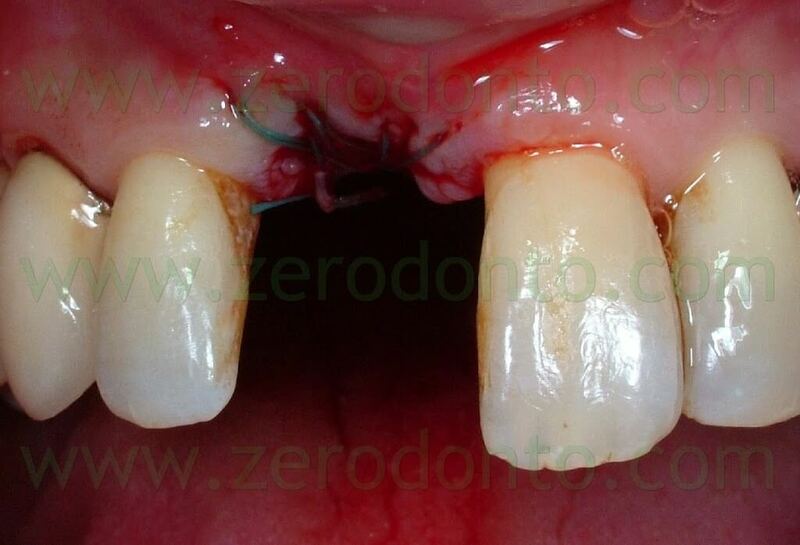 The temporary crown was carefully checked in occlusion as previously described, so as to avoid implant overload. 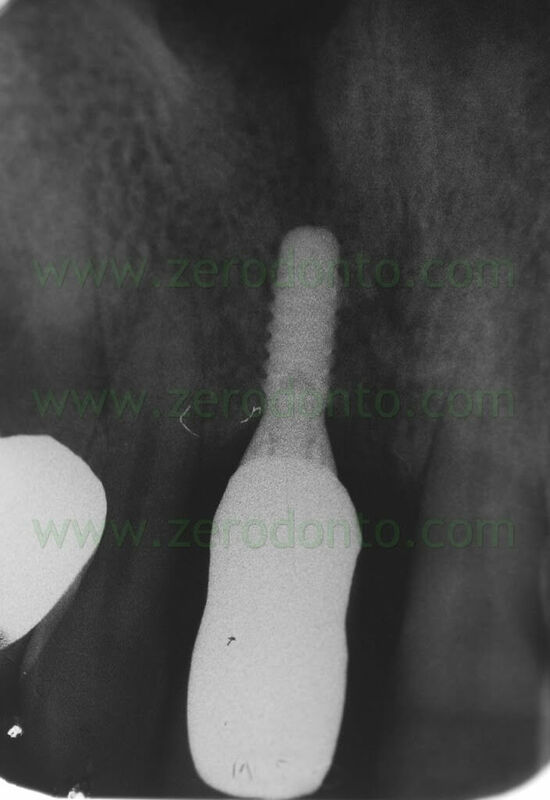 The patient was exhaustively informed about the proper procedures of home oral hygiene according to the new prosthetic geometry. 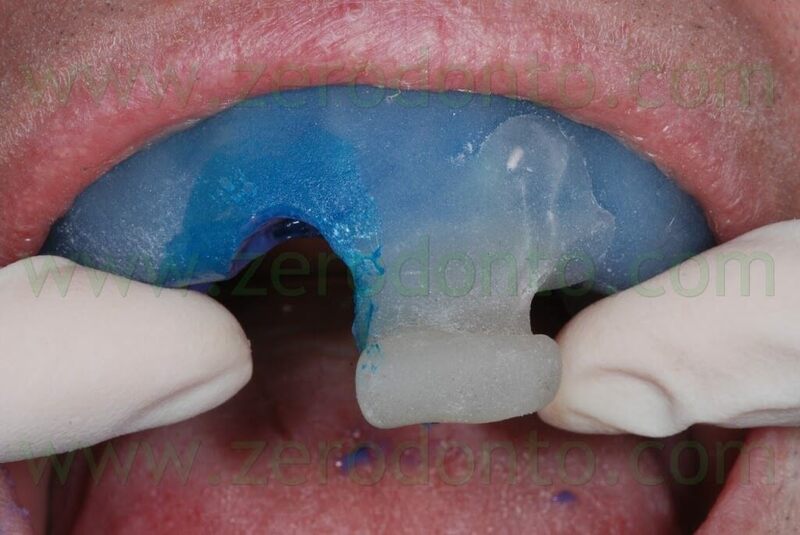 After 2 weeks of temporarization in order to promote periimplant soft tissue maturation and shape the transmucosal passage, the effectiveness of the occlusal contacts was checked and an alginate impression was made to prepare a resin custom tray. 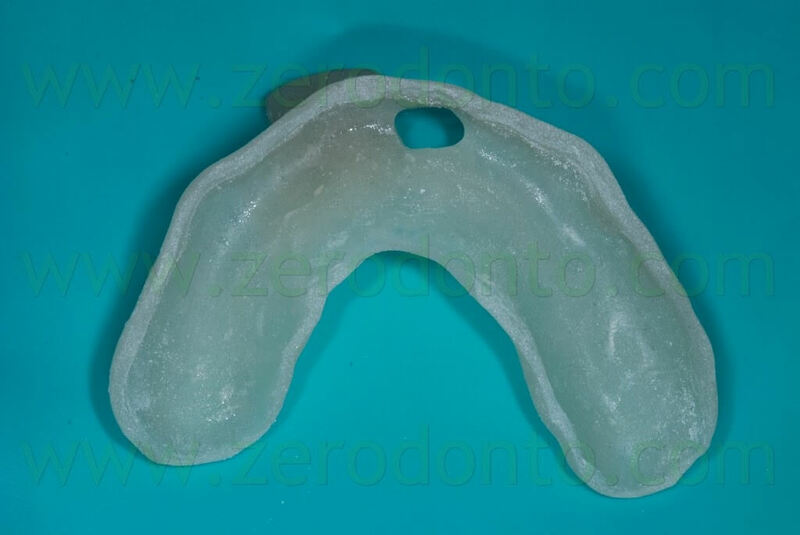 Such individual tray has to be made at least 24 hours before impression taking, so that resin polymerization shrinkage will not affect the precision of the impression. 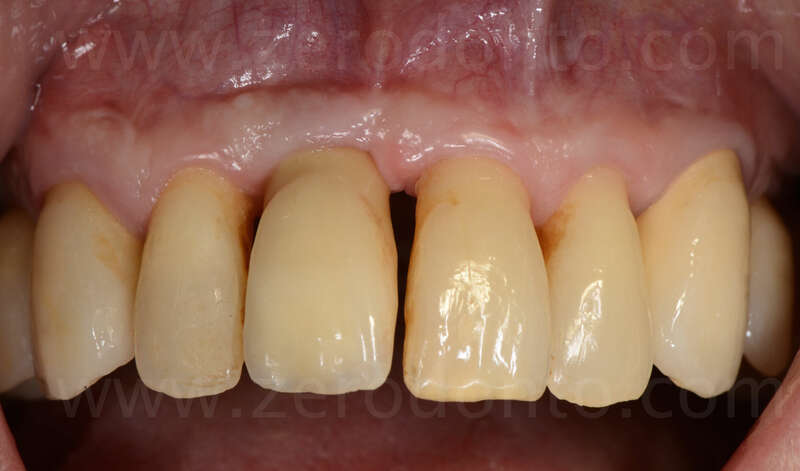 In order to avoid periimplant soft tissues collapse and the alteration of transmucosal passage, the impression coping was customized with acrylic resin. 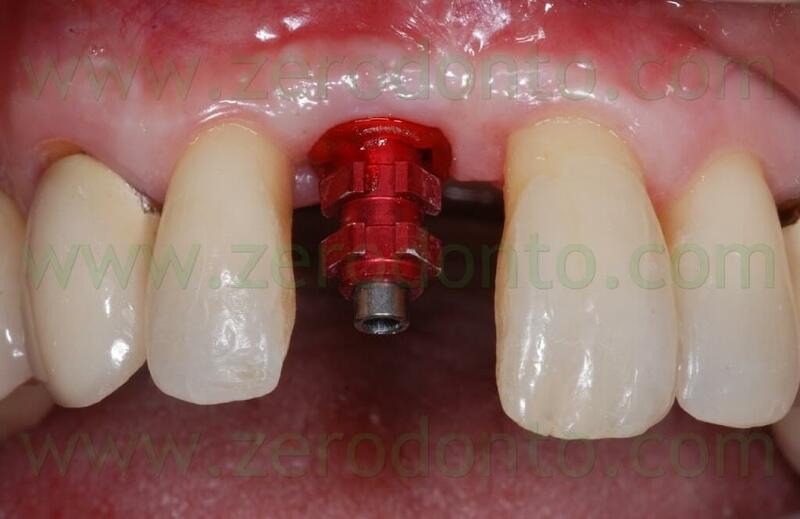 The temporary abutment was screwed onto a laboratory implant analogue and the temporary crown was put on it similarly to the intraoral position. 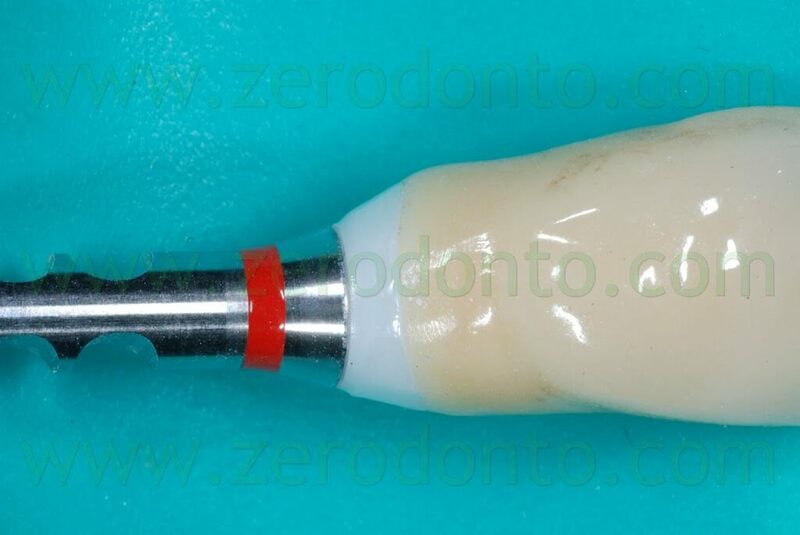 A condensation silicon index was made to copy the transmucosal shape of the temporary restoration. 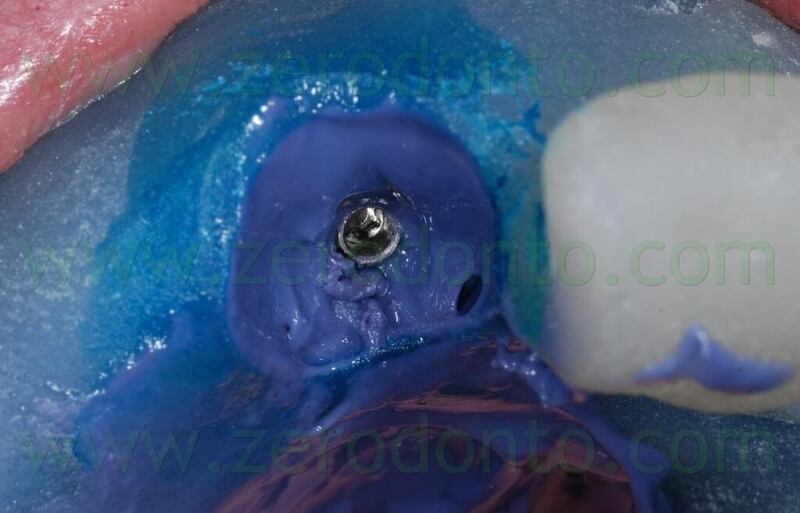 Once the silicon completed the polymerization, both the provisional crown and abutment were removed and the transfer coping was screwed onto the laboratory implant analogue inside the silicon index. 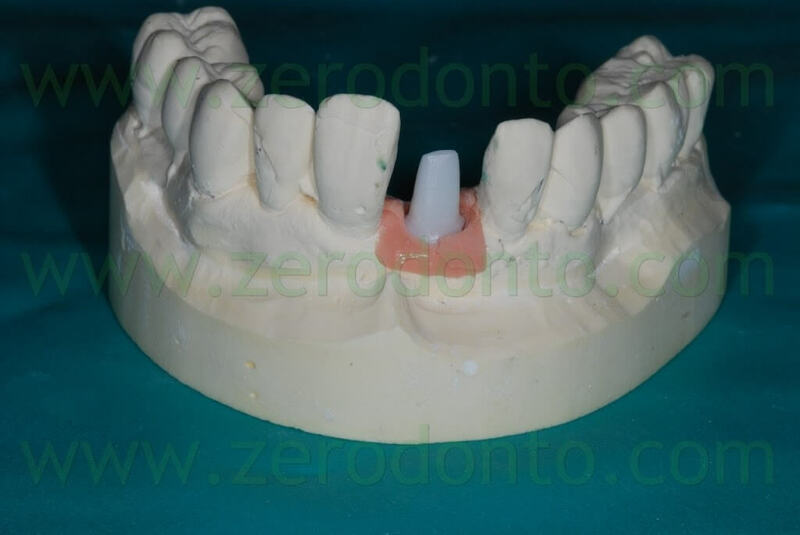 Then, the transfer coping was customized with acrylic resin, in order to reproduce the transmucosal shape of the temporary restoration. 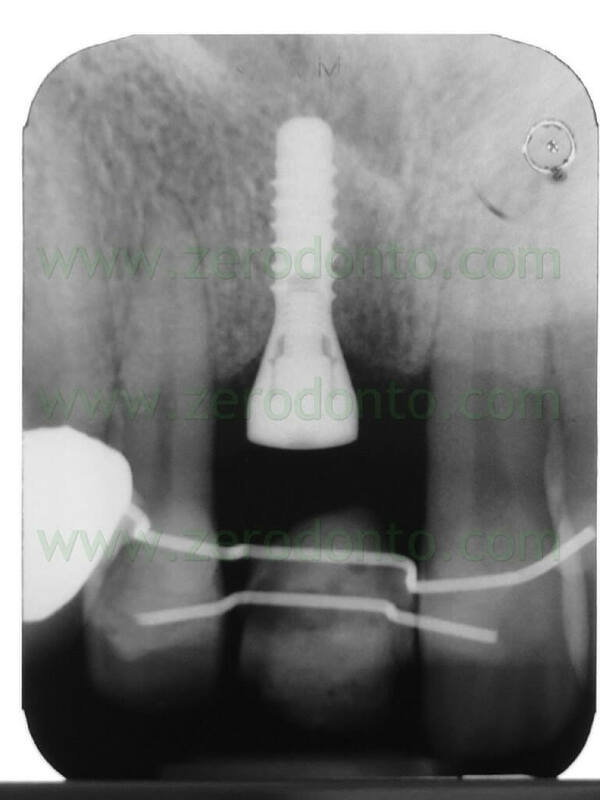 After removing the healing screw, the customized transfer coping was screwed intraorally onto the implant at 15 Ncm, using a dynamometric tool. 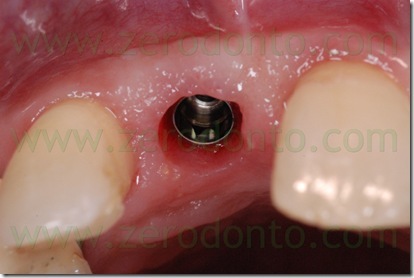 The correct coupling between the impression coping and the implant neck was checked radiographically. 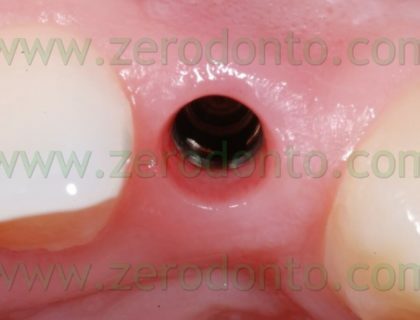 A hole was made in the custom tray in correspondence to the implant, in order to allow unscrewing of the impression coping. 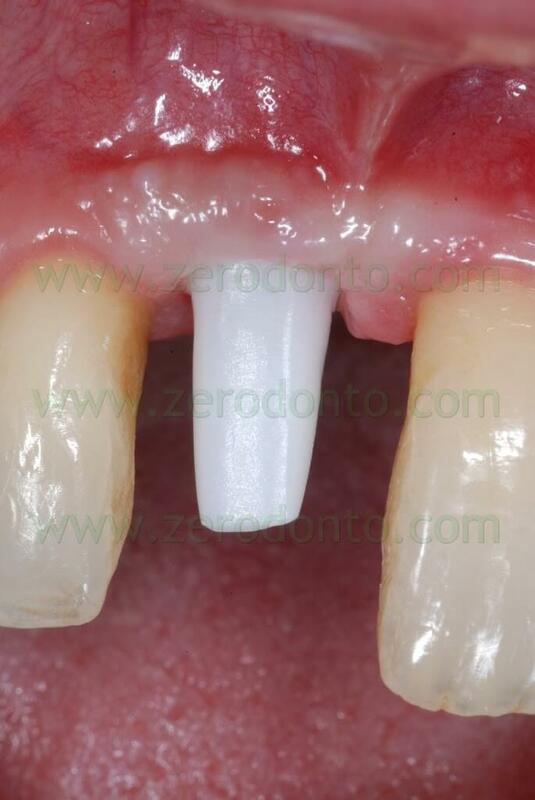 The custom tray was tried intraorally to check the matching between such hole and the impression coping. 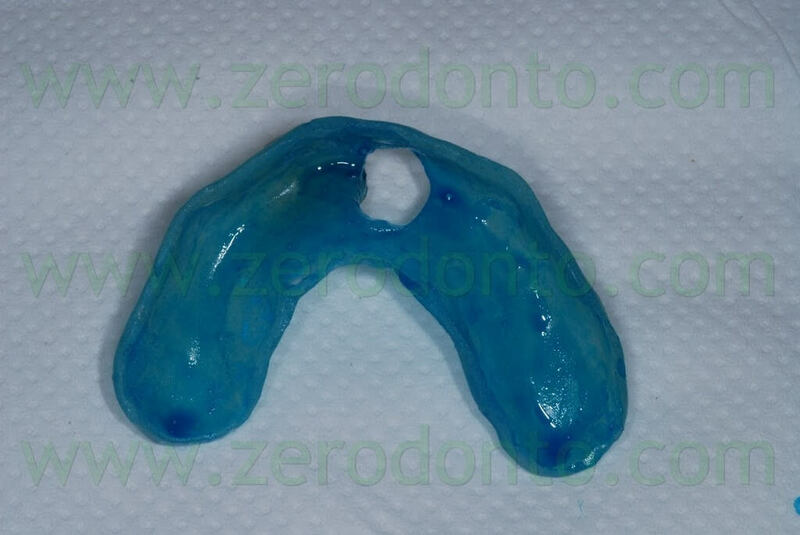 A polyether adhesive was applied onto the custom tray and an impression was made using a medium consistency polyether. 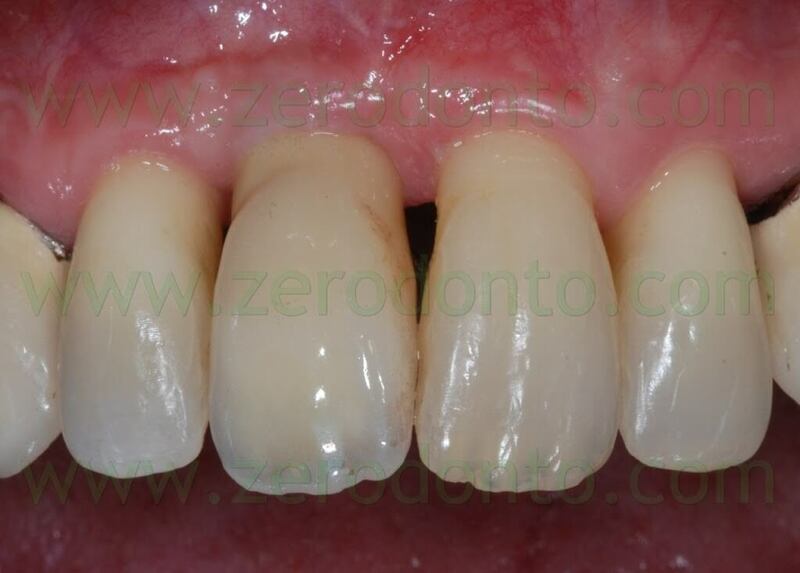 One week after the impression, the final restoration was made by means of a zirconia abutment and a zirconia-ceramic crown. 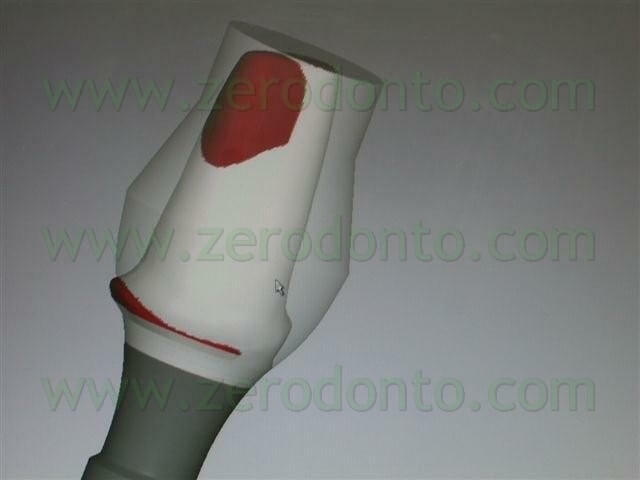 A modelling resin was used in the dental laboratory to customize the abutment; then, its shape was scanned by means of CAD technology. The original treatment planning was made to use the Etkon system (Straumann). 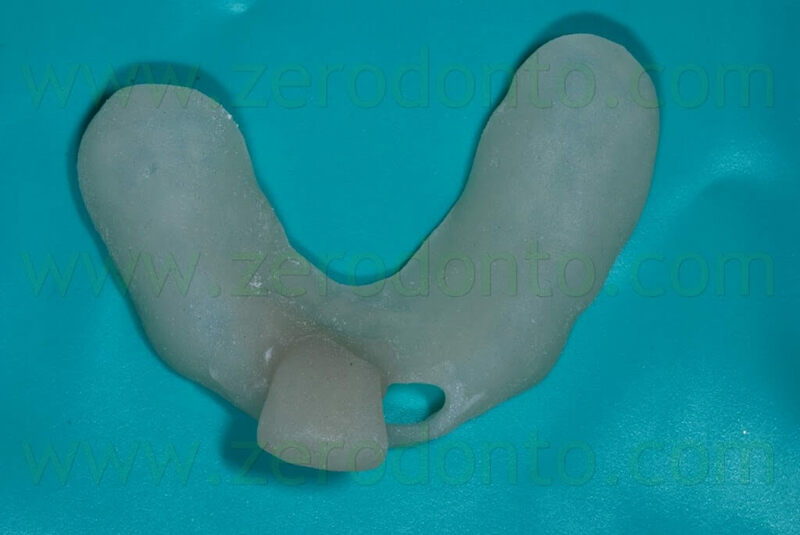 Nevertheless, when the final restoration was made, Etkon zirconia blanks did not allow to realize the shape modelled in the dental laboratory. 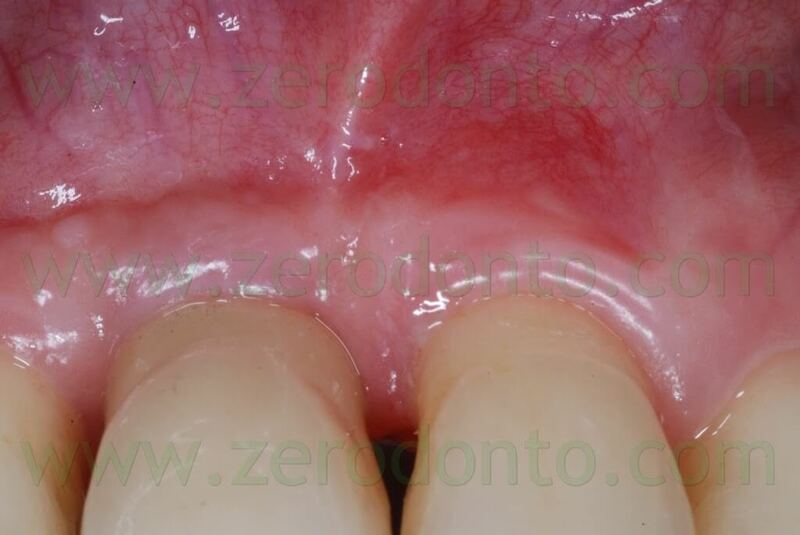 Particularly, the ideal angulation of the abutment was out of the drilling areas at level of both the cervical and incisal regions (red areas). 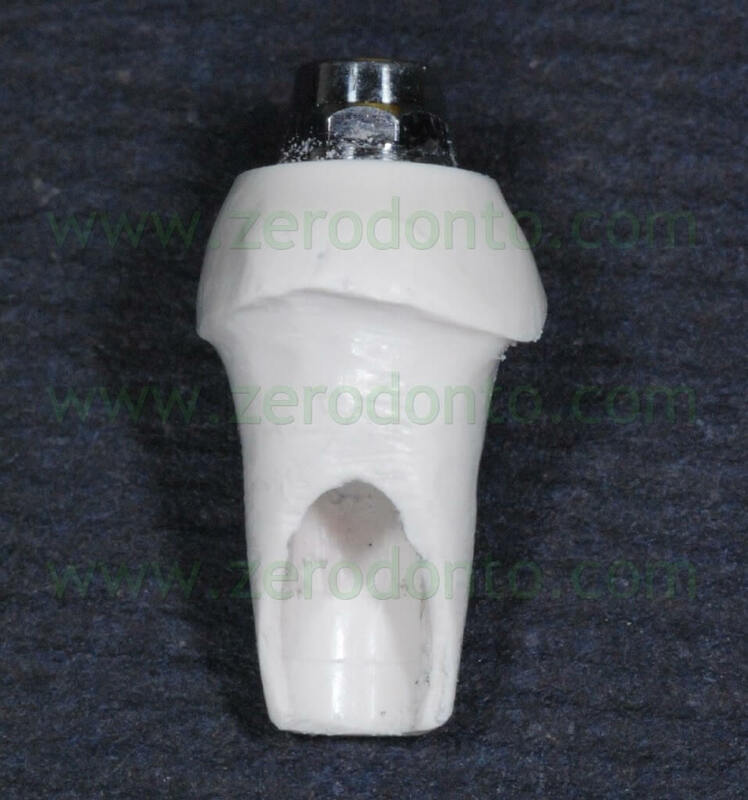 As a consequence, both the abutment and the zirconia coping were realized using the Procera CAD-CAM System (Nobel Biocare). The abutment was designed placing the prosthetic shoulder 2 mm far from the periimplant soft tissues, in order to correctly remove cement excess. 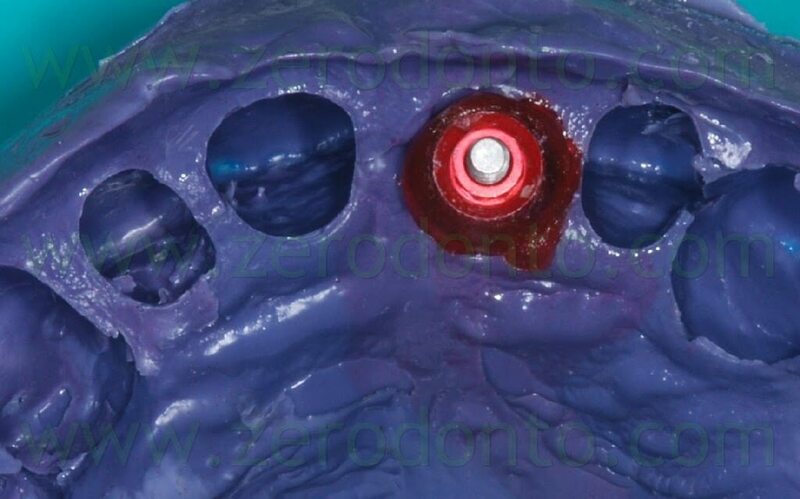 After industrial processing, the customized abutment was checked and refined in the dental laboratory under magnification, using a stereomicroscope. 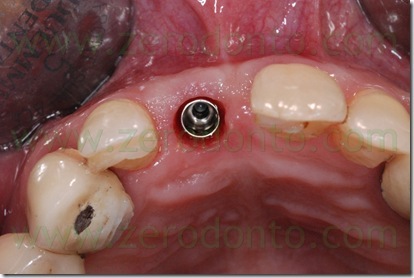 Such abutment was screwed intraorally onto the implant at 35 Ncm using a dynamometrical tool. 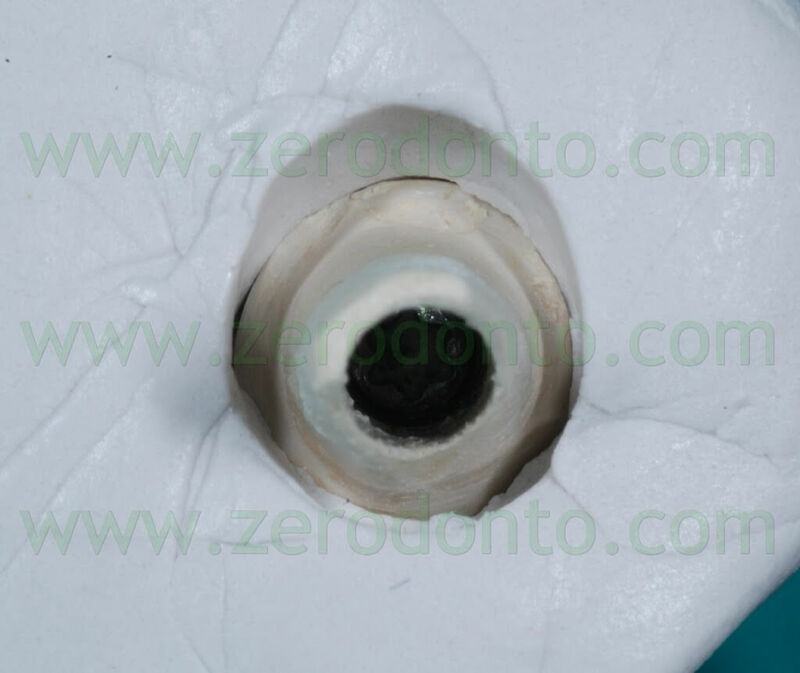 The occlusal screw was covered by means of cotton pellets and a light curing composite material. 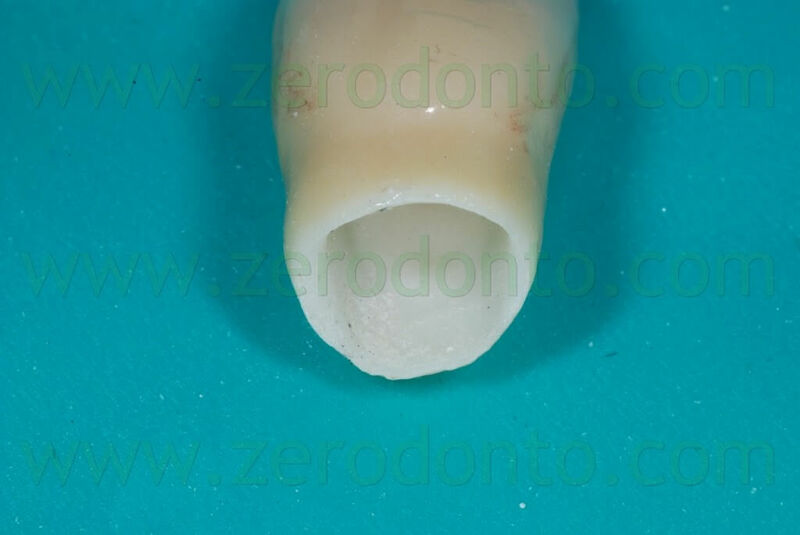 The precision of the prosthetic margin was verified intraorally using a teflon probe under magnification and radiographically. 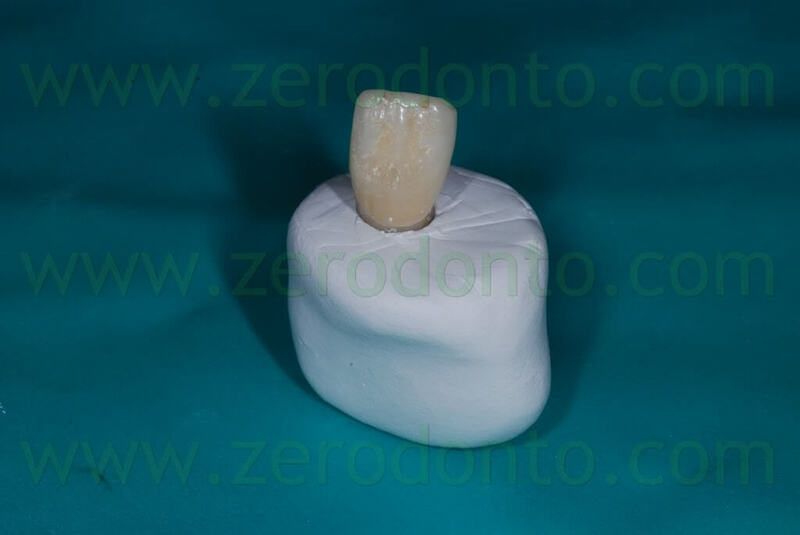 Then, a medium-consistency polyether impression was made to register the three-dimensional position of both the zirconia framework and the soft tissues. 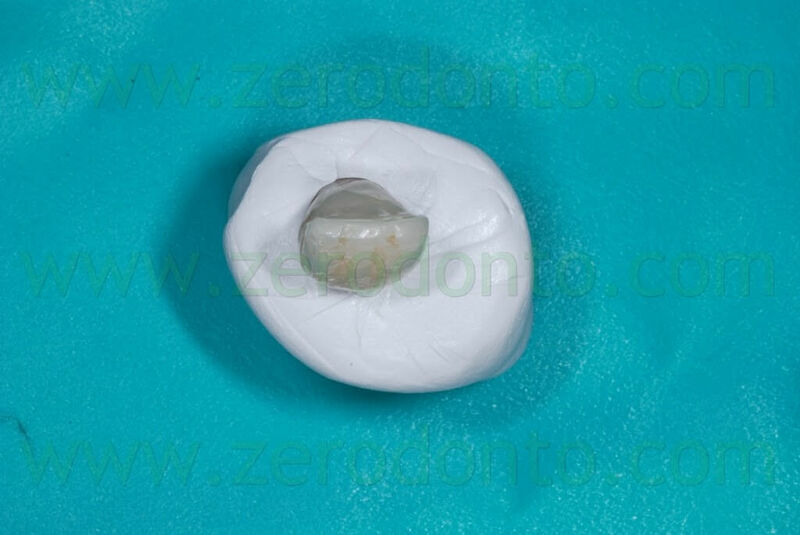 A thin film of liquid paraffin was put inside the zirconia coping in order to increase its retention during impression procedures. 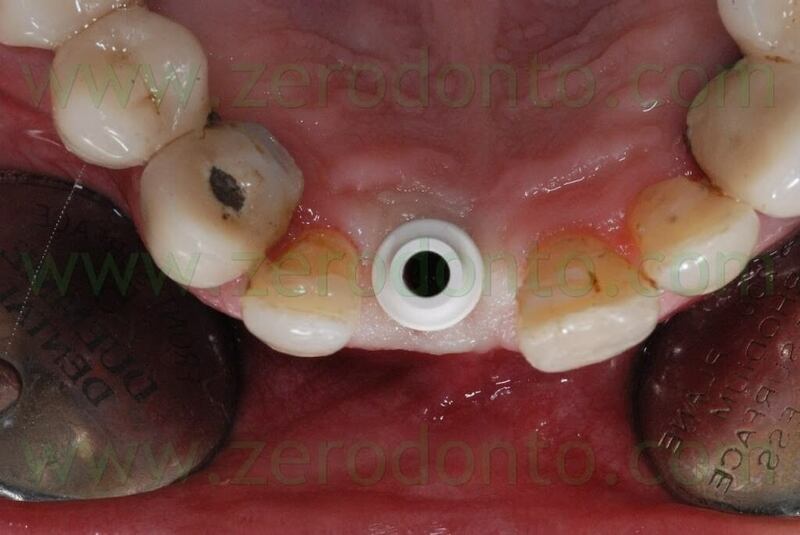 After the impression, the temporary crown was luted onto the abutment using a provisional resin cement. 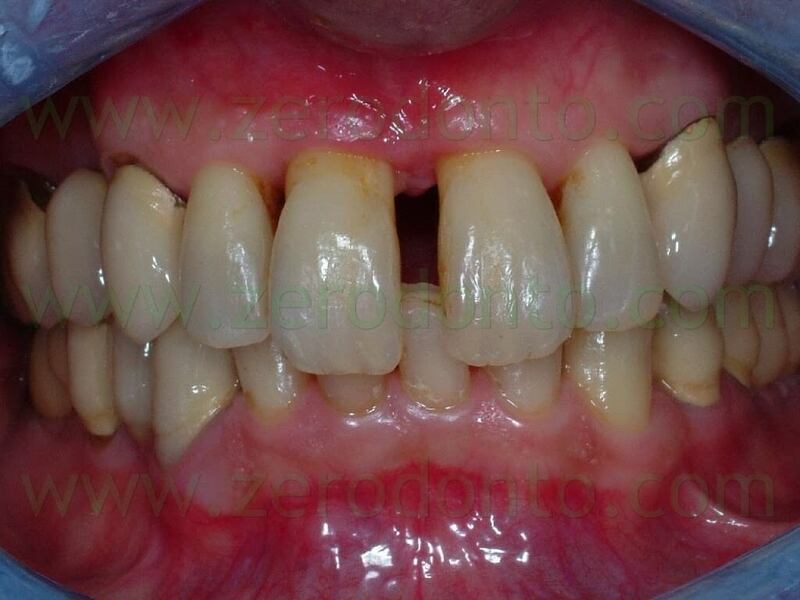 As previously described, a color check of the adjacent teeth was made to realize the final restoration. 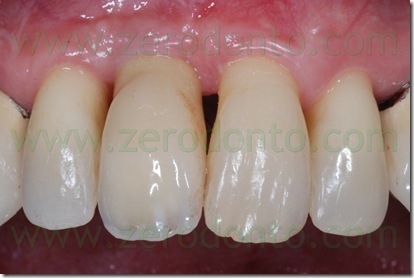 The veneering ceramic was a feldspathic ceramic dedicated to zirconia. 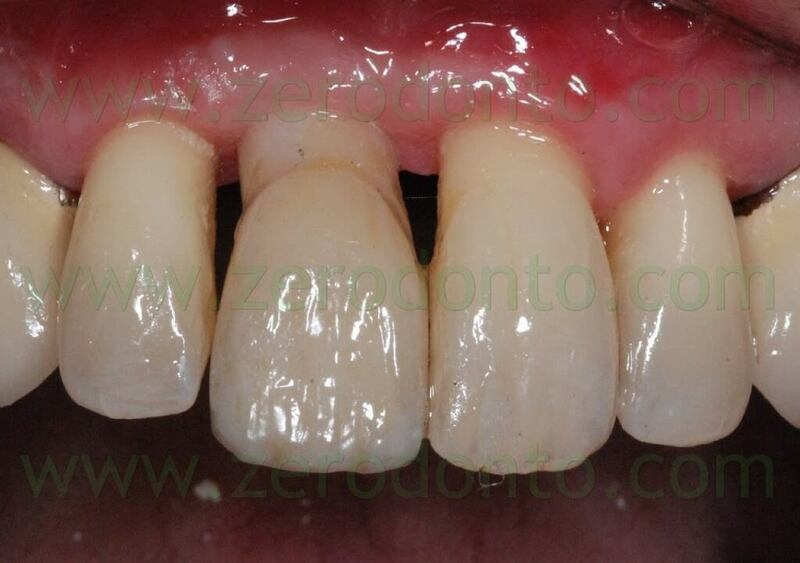 A ceramic intraoral try-in was performed to verify both the shape and the color of the final restoration. 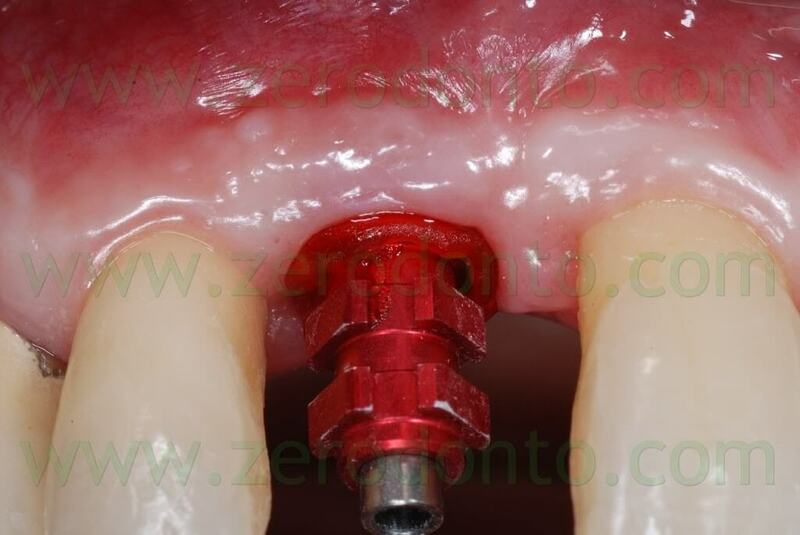 Then, after finishing and polishing in the dental laboratory, the final crown was cemented onto the implant-supported abutment using a dual cure resin cement (RelyX Unicem Clicker), according to the manufacturer’s instructions. 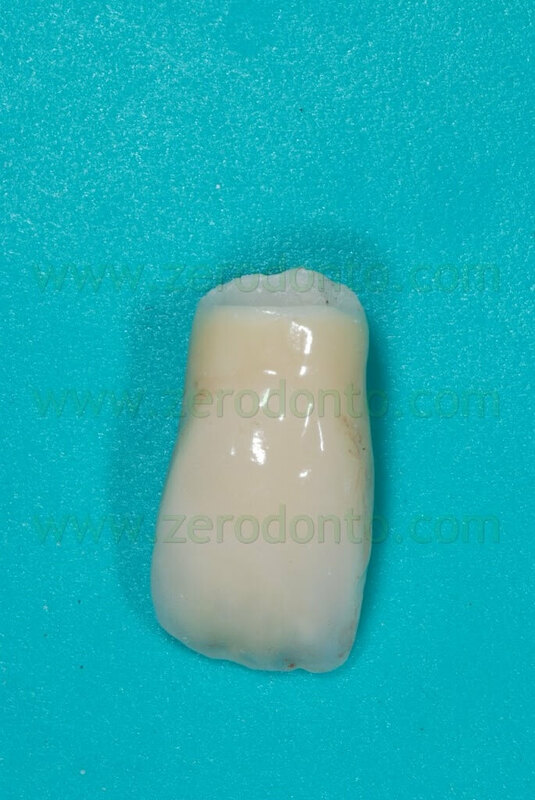 As previously described for the temporary restoration, the outer surface of the final crown was isolated by means of liquid paraffin, so as to facilitate cement excess removal. 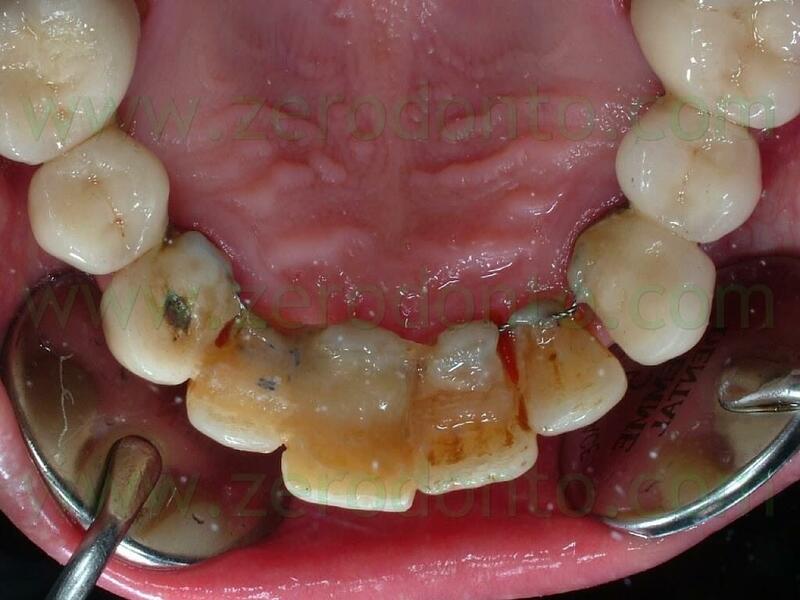 Once the crown was seated, both the buccal and palatal surfaces were light cured for 2 sec. 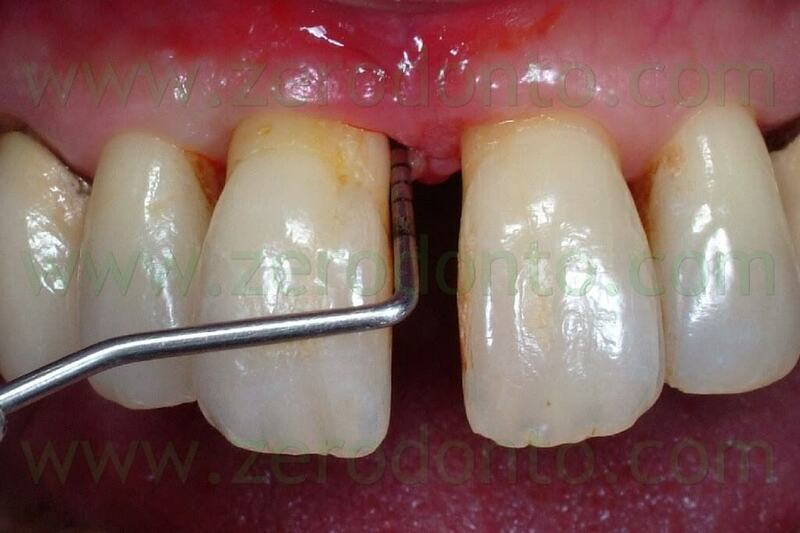 in order to allow the cement to become a gel and ease cement excess removal using a plastic scaler. 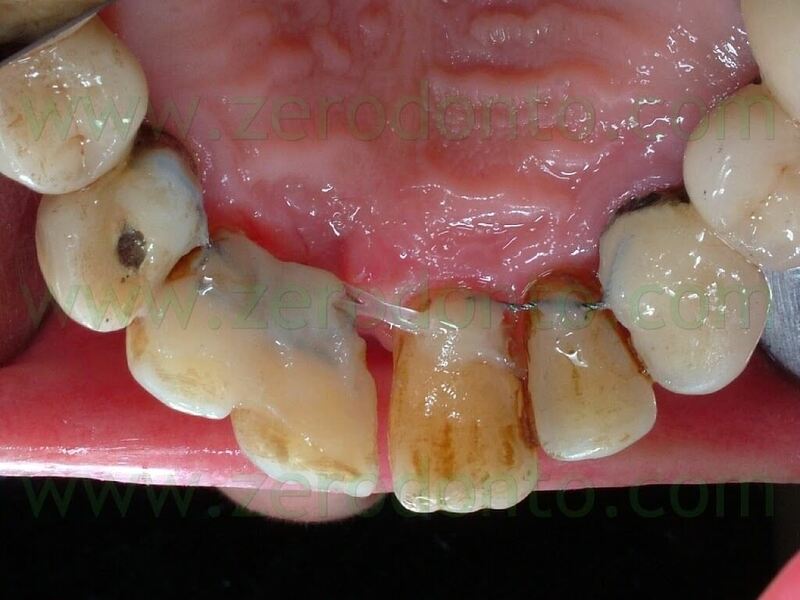 A waxed floss was then used to remove cement excess from interproximal spaces. 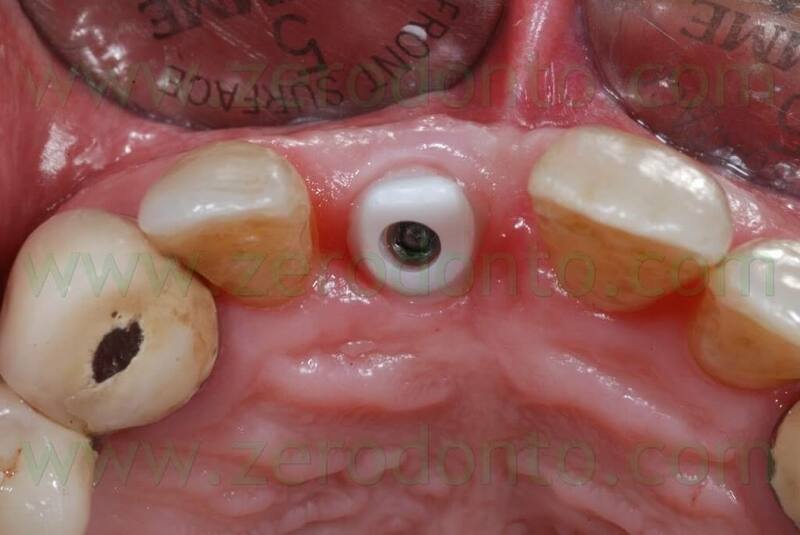 The occlusal contacts were carefully checked both in centric occlusion and protrusive and lateral movements. 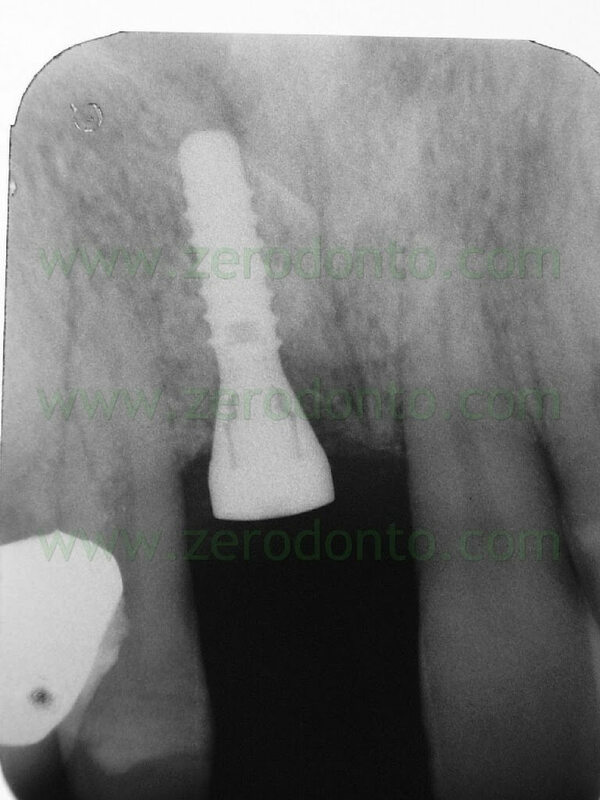 A periapical radiograph was made to verify the prosthetic precision after cementation. 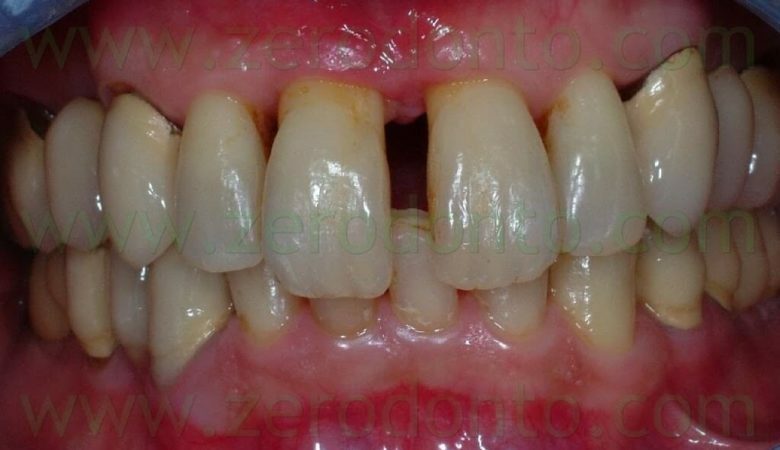 Graduated with full marks and honors in Dentistry at the University ‘Federico II’ of Naples in 1996. Attended a post-graduate course in Periodontology and Implant Dentistry at the Dental School of the University ‘Federico II’ of Naples in 1999-2000. 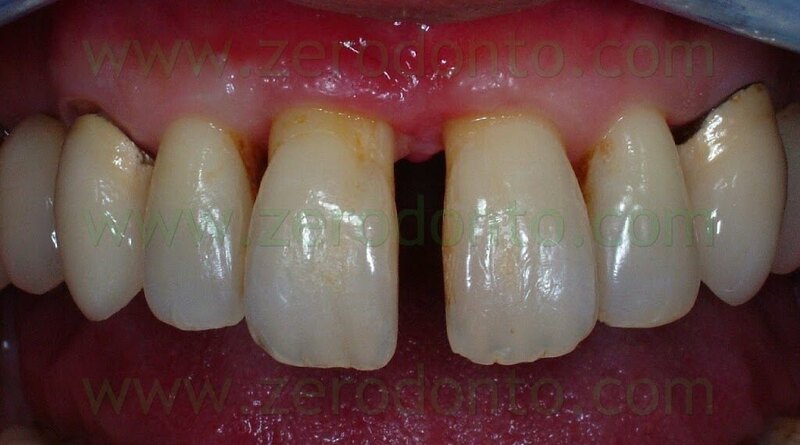 In 2003, received the PhD in Periodontology at the same University. Co-Author of the textbook ‘Atlas of Bracketless fixed Lingual Orthodontics’, Quintessence Publishing. Lecturer at several national and international congresses. Post-graduate and Master Courses. Works as a private practitioner in Naples, Italy. 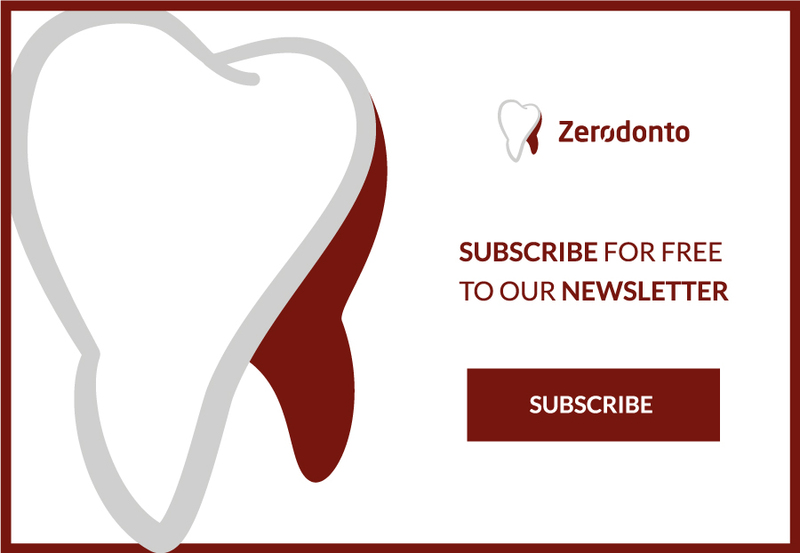 Founder of Zerodonto, dental blog and online community. 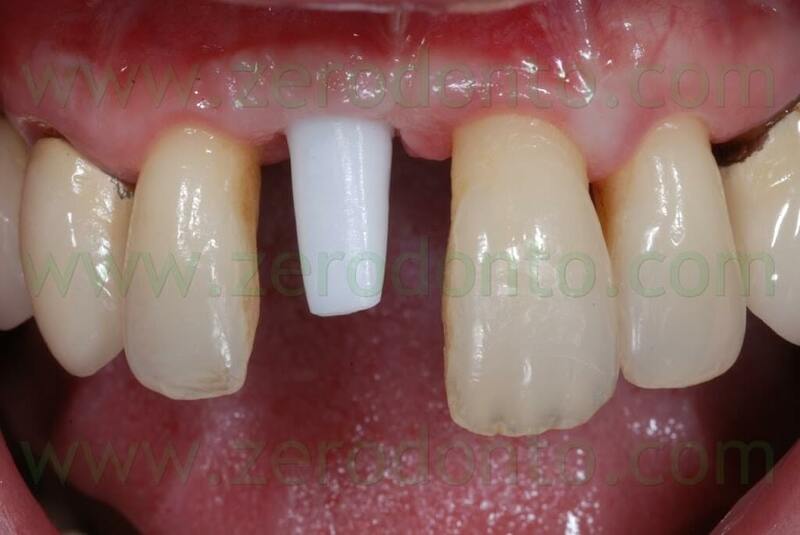 His main clinical interests are Periodontics and Implant Dentistry.Complete resume here. Graduated with full marks and honors in Dentistry in 2002 at the University Federico II of Naples. Post-graduate course in “Traditional and implant-supported prosthodontics and restorative biomechanics” (2003); Master of Science and PhD in “Dental materials and their clinical applications” at the University of Siena (2004-2006); post-graduate course in “Smile esthetics” (2012). 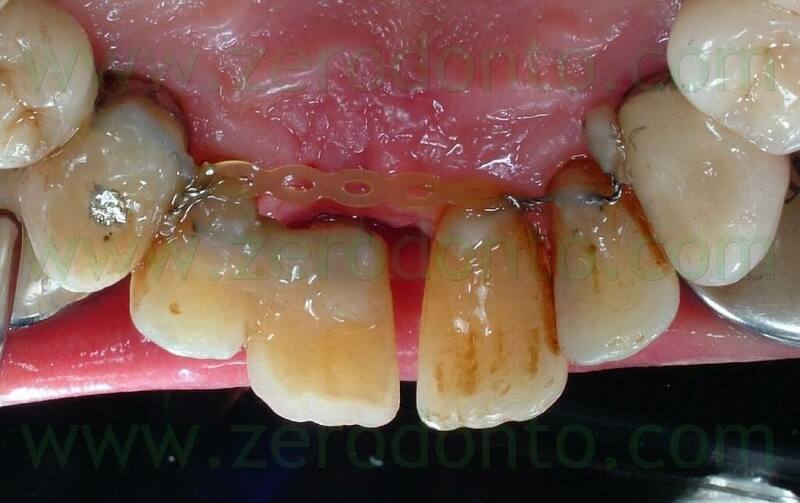 Research Professor of Prosthodontics and Digital Dentistry at the University Federico II of Naples. Qualified as Full and Associate Professor in 2017. Aggregate Professor of Prosthodontics and Digital Dentistry at the University Federico II of Naples and at the University of Siena. Lecturer at several national and international Post-graduate and Master Courses in different Universities. 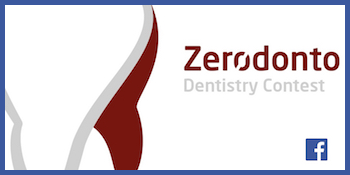 Researcher, expert and consultant for national and international dental companies. 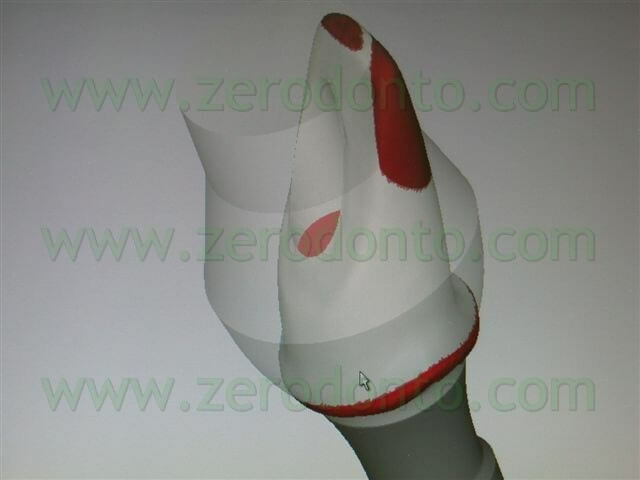 Coworker in several PRIN projects and Principal Investigator of a FIRB research project about “Biomechanics and biomimetics in implant-supported prosthodontics” shared between the Second University of Naples and the University “Vita Salute San Raffaele” of Milan. Author of more than 130 publications in national and international peer-reviewed scientific journals and co-author of chapters of books on Prosthodontics. Reviewer of more than 30 international peer-reviewed scientific journals. Speaker at national and international meetings. Past President of the Membership and Recruitment Committee of the International Association for Dental Research (IADR). Member of the Academy of Dental Materials (ADM) and of the Italian Society of Dentistry and Maxillo-Facial Surgery (SIOCMF). Past Secretary of the Italian Society of Prosthetic Dentistry and Implant Prosthodontics (SIOPI). 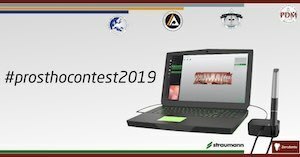 Winner of many national and international prizes for research and clinical activity in prosthodontics, esthetic dentistry, biomechanics and dental materials. Co-founder of the dental blog and community Zerodonto (www.zerodonto.com).Complete resume here. Graduated with full marks and honors in Dentistry in 2004 at the University ‘Federico II’ of Naples. 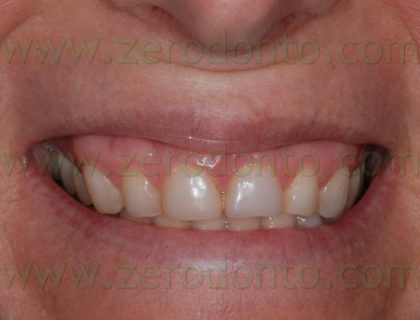 She attended a Postgraduate Retraining Course in Orthodontics in 2004/2005 at the University ‘Federico II’ of Naples. Then she specialized in Orthodontic in 2010 at the Catholic University of the Sacred Heart of Rome. 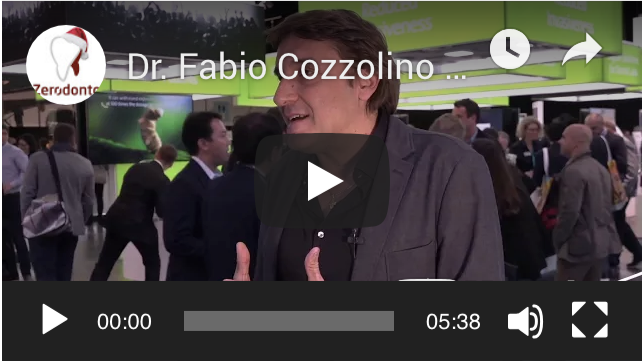 Founder of the dental blog Zerodonto “https://www.zerodonto.com/en/" with Dr. Fabio Cozzolino and Dr. Roberto Sorrentino. Author of a book on lingual orthodontics: “Atlas of bracketless fixed lingual orthodontics”, Quintessences publishing Italia. Author of national and international orthodontic publications. Lecturer at several national and international Conferences, Courses and Master Courses in different Universities about Orthodontics and multidisciplinary approach. 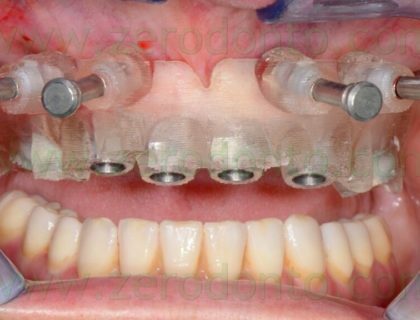 Her main clinical interest is bracketless invisible fixed lingual orthodontics. 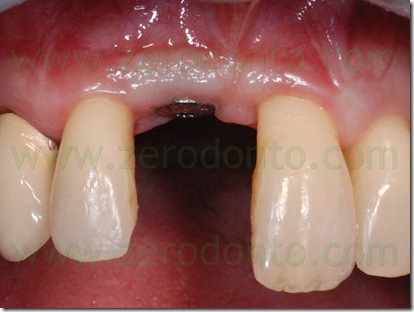 She works as private practitioner in Naples at Cozzolino Dental Office.Complete resume here. Mr. Mutone was born on January 20th, 1965 and obtained his qualification as a dental technician in Naples IPSIA “Casanova”.He holds a lab since 1983.He took part in many courses in Italy and abroad among which some with Klaus Muetherties and Willi Geller, from whom he learnt his practical teaching and aesthetic philosophy attending many times his lab in Zurich (CH). 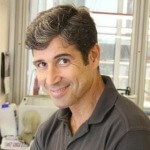 He was business partner and co-owner of the Oral-Design 2 lab along with Mr. Giuseppe Zuppardi in the years 1994-96. When this experience was over he met professionally Mr. Atoshi Aoshima, who led him to appreciate Japanese aesthetic school. 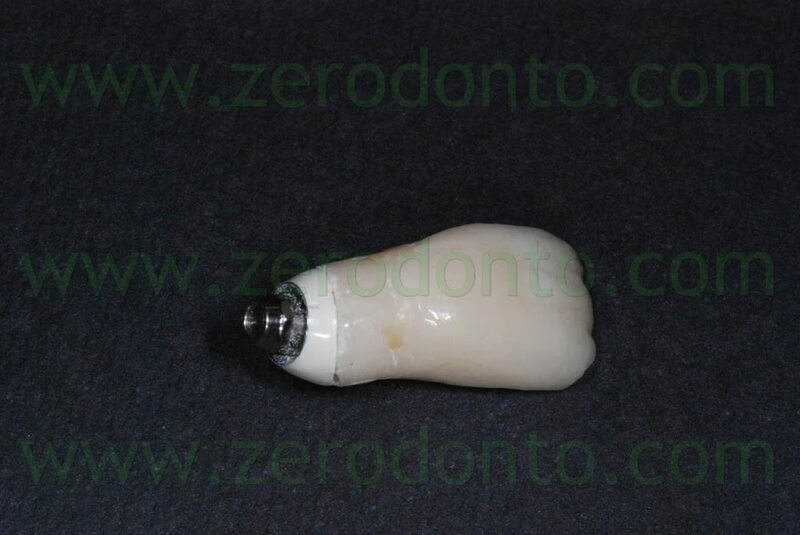 After this experience he started another project that led him to make a systematics for ceramic masses multistratification for the Noritake Kizai, LTD company (Japan).In the last decade he has held conferences and communications on metal ceramics and aesthetics in many national and international meetings.Today he focuses particularly on prosthesis implant and aesthetics using modern materials such as zirconia and CAD-CAM methods. 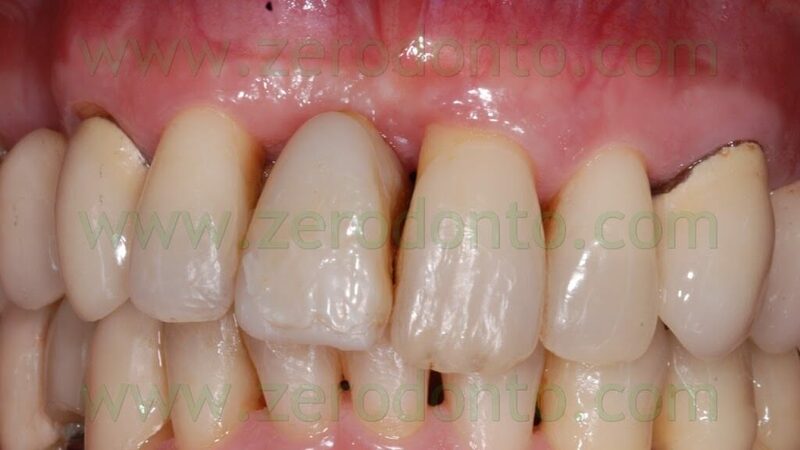 He is also taking part in projects that aim to carry out and spread implantology based on computer planning with immediate function application and in the making of a multistratification system on zirconia oxide structures.